Make yourself at home in one of the 54 air-conditioned rooms featuring flat-screen televisions. Complimentary wireless Internet access keeps you connected, and cable programming is available for your entertainment. Bathrooms have bathtubs or showers and hair dryers. Conveniences include coffee/tea makers, as well as phones with free local calls. Make yourself at home in one of the 347 air-conditioned rooms featuring refrigerators and MP3 docking stations. Your pillowtop bed comes with down comforters and premium bedding. Complimentary wired and wireless Internet access keeps you connected, and satellite programming provides entertainment. Private bathrooms have designer toiletries and hair dryers. Landmark Downtown Detroit Hotel Appeals to Business and Leisure Guests The award-winning Crowne Plaza® Detroit Downtown Riverfront Hotel stands out in downtown Detroit's business district, with its location neighboring the convention center near the riverfront. Located just off M-10 Lodge Freeway and within walking distance of Cobo Center, this Detroit hotel won IHG's Designer of the Year . Eighteen meeting rooms, including a 12,000-sq-ft ballroom, offer meeting space with audio-visual capabilities and catering services for a variety of special events. A popular worldwide business draw, this downtown Detroit hotel is near the GM® world headquarters as well as Quicken Loans & Rock Financial Holdings® and PricewaterhouseCoopers® and DMC Medical . 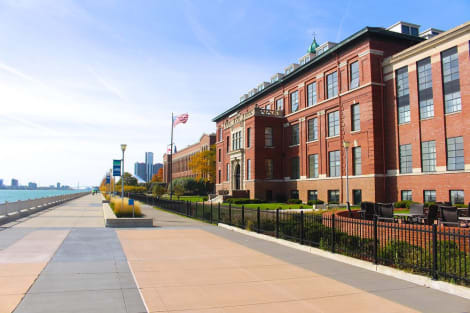 Leisure guests find excitement at nearby popular sporting venues, which are home to the Detroit Lions-Ford Field, Detroit Red Wings and the Detroit Pistons-Little Caesar's Arena, and Detroit Tigers-Comerica Park. Historic Hart Plaza, Campus Martius, and the Riverwalk short walk, and must-see attractions for Motor City visitors. Don't forget the famous Greektown with a plethora of dining and entertainment options, including Greeektown Casino. This Green Engage® city center hotel in downtown Detroit , and offers easy access to the Detroit "People Mover" transportation system. Experience rejuvenated city life on your next business trip or vacation at Crowne Plaza® Detroit Downtown Riverfront. Featured amenities include a 24-hour business center, express check-in, and express check-out. Planning an event in Detroit? This hotel has facilities measuring 2110 square feet (196 square meters), including conference space. RV/bus/truck parking is available onsite. Featured amenities include complimentary wired Internet access, dry cleaning/laundry services, and a 24-hour front desk. Planning an event in Detroit? This hotel has facilities measuring 21000 square feet (1951 square meters), including conference space. Enjoy seafood at Fishbones Rhythm Kitchen, a restaurant which features a bar, or stay in and take advantage of the room service (during limited hours). Relax with a refreshing drink at one of the 2 bars/lounges. Cooked-to-order breakfasts are available daily from 6:30 AM to 10:30 AM for a fee. Satisfy your appetite for lunch or dinner at the hotel's restaurant, Courtyard Cafe, or stay in and take advantage of the room service (during limited hours). Quench your thirst with your favorite drink at the bar/lounge. Buffet breakfasts are available daily from 6 AM to 11 AM for a fee. Featured amenities include a 24-hour business center, limo/town car service, and express check-in. Planning an event in Detroit? This hotel has facilities measuring 30,000 square feet (3 square meters), including conference space. Free valet parking is available onsite. lastminute.com has a fantastic range of hotels in Detroit, with everything from cheap hotels to luxurious five star accommodation available. We like to live up to our last minute name so remember you can book any one of our excellent Detroit hotels up until midnight and stay the same night.